Now we're going to keep talking about history and go to the hills of little Lynchburg, Tenn., to the home of Jack Daniel's. And as part of the whiskey's 150th anniversary, the company is highlighting some of the lesser-known stories, including how a former slave played a key role. Blake Farmer of member station WPLN went to Lynchburg to learn more. 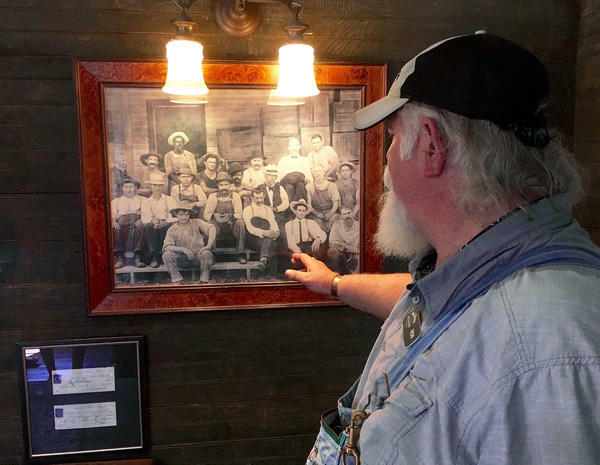 BLAKE FARMER, BYLINE: Each year, 300,000 people find their way off the beaten path to visit the Jack Daniel's Distillery. RON CRAIG: Y'all get in here now. Shake hands with Uncle Jack. Here you go. Come and get it. Open your mouth. (Inaudible). FARMER: Visitors whiff the potent 80-proof air as a tour guide flaps this giant lid of a mellowing barrel two stories tall. Debra Bevill is from Lubbock, Texas, and she's soaking it all in. DEBRA BEVILL: This has been a two-year planning vacation for me to come here and see where my boyfriend came from. FARMER: Your boyfriend's from Lynchburg? BEVILL: No, my boyfriend's Jack Daniel's. FARMER: A joke, though I was slow to get it. But Bevill takes her drink of choice seriously. She's got Jack Daniel's bottles tattooed on her upper arm. She only takes it straight to honor the history. Before this tour, Bevill knew the high points. Jack Daniel leaves home as a young teen, goes to work for Dan Call, ironically a pastor, ends up helping with his whiskey still. But she hadn't yet heard about Nearis Green, one of the pastor's slaves. Even Green's descendants were kind of in the dark. CLAUDE EADY: My mother said something to me about it when I was real small, but I didn't think nothing about it back then, you know? FARMER: This is Claude Eady, a 91-year-old relative of Nearis Green who himself worked an entire career at the distillery. He's looking through some old photos from the 1940s when they made whiskey the very same way they do today, running it through charcoal made on site. EADY: Run the whiskey in the top, and it come out the bottom. Take a long time for it to go through that charcoal. FARMER: This method of mellowing probably wasn't some kind of Green family recipe. Everyone in these hills was making it the same way, says Jack Daniel's company historian Nelson Eddy. NELSON EDDY: There were so many people distilling whiskey, and charcoal mellowing was common to this area. FARMER: Really Eddy isn't sure what Nearis Green's role was. Corporate record keeping in 1866 - not what it is today. So there are lots of blanks to fill in. EDDY: There's a lot of mystery there. We don't know exactly what he taught Jack. But we do know that Jack had a great deal of respect for that family because I think the best part of this story really is the photograph that hangs in the old office. FARMER: There's Jack Daniel with a gray goatee around 1895 surrounded by his crew, including two African-American men believed to be the sons of Nearis Green. This photo is not some new discovery, and the fact that a former slave played a part in the origin story has been mentioned in books. So we ask Phil Epps, the director of Jack Daniel's global marketing, whether this was an effort to create some racial diversity as a potential advertising angle. PHIL EPPS: Yeah, that's definitely not the case, and we honestly don't see it as scandalous. We honestly just thought that, you know, the 150th year is a great opportunity to tell some of those lesser-known stories, and this just happens to be one of them. CRAIG: Folks, we're going to head into the heart of the whole operation (inaudible). FARMER: The real keepers of the Jack Daniels story are the tour guides. They have no script to follow, just a batch of tales to pick from. And not all are convinced that Nearis Green's role is worth mentioning. Ron Craig only talks about him if visitors ask. CRAIG: There is no hard truth. I can't tell you for sure exactly what everything was back in the day, and no one else can either. 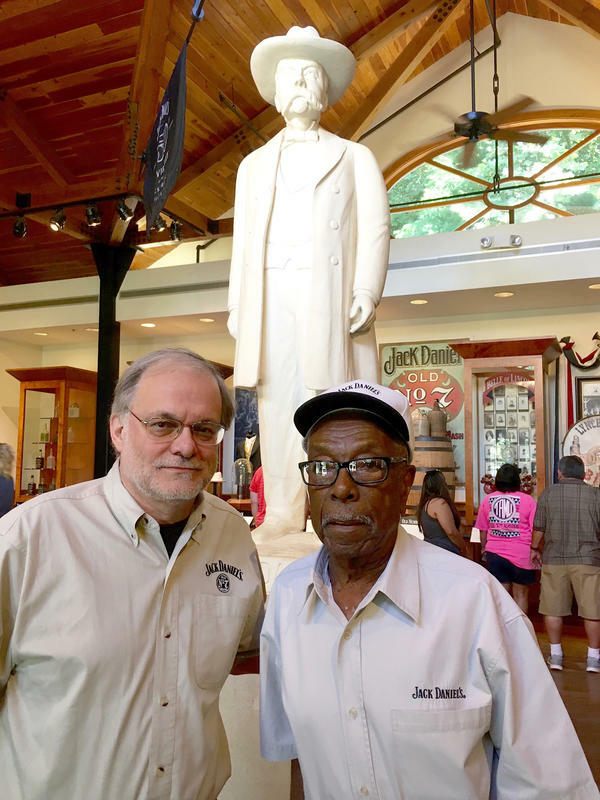 FARMER: But increasingly, the Jack Daniel's corporate office hopes the name of a former slave is weaved into the stories told to those who make the pilgrimage here each year. For NPR News, I'm Blake Farmer in Lynchburg, Tenn. Transcript provided by NPR, Copyright NPR.